On Saturday, my daughter, sister, and I Metroed downtown for Washington’s annual Cherry Blossom Festival Parade. My wife stayed home sick. I brought along the Canon 20D and Canon EF 135mm f/2 USM lens, which performed as well as the previous weekend’s cherry blossom watch. The prime lens continues to delight. 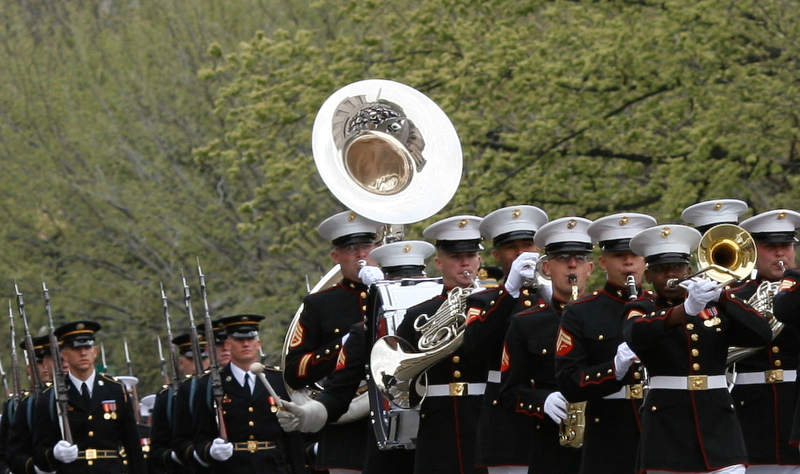 This was our first Cherry Blossom Festival Parade, which had a strong military presence. I’ve got nothing against the service, but the parade of uniforms reminded that America is at war and diminished the event’s meaning. I expected a lot more processions related to Japanese culture. Rather, there were more uniforms and representatives of commercial interests, such as Target. No doubt reflective of American society right now—the military and capitalists—I expected more Japanese cultural fare. Still, there were marching bands and performers from around the country, and it’s great to think of these High Schoolers coming to Washington—got to be an exciting trip for many of them. I’ve put up a Cherry Blossom Festival gallery at my SmugMug. I did quite a bit of selective cropping for this gallery, mainly because the Canon 135mm prime lens reaches so far and captures remarkable detail. Police prevented spectators, including photographers, from going into the street. I had to shoot many subjects from longer distances. My sister visited from Guatemala, where she is a Christian missionary. We had to resolve some software issues with her MacBook. Her mission work is self-funded, and one way she pays is working remotely for a U.S. company that specializes in training for Microsoft software. There had been an issue using Citrix client from her Mac, which the Microsoft-oriented company refused to assist with. After months of failure, we finally resolved her Citrix problems during the visit. I finally talked my sister into getting a real digital camera. Her vintage 1999 HP digicam simply wasn’t good enough. She ended up choosing the Canon PowerShot G7; I had used the G5 before switching to dSLRs. Whoa, have digicams changed! The G7 has image stabilization, ISO to 1600 and 3200 and handy manual controls as well as plenty of automatic presets. She started reading from Digital Photography: The Missing Manual and using the camera right away. She has little practical experience with digicams, but showed real gusto to learn real fast. The idea is for her to blog about her mission work and use the photos to show the work. She has been sending out occasional e-newsletters, but blogging would be more regular and include photos. The blog would be a better way for her to show something substantial to her financial supporters and possibly generate additional support. Looks like she will set up shop at Vox.